Happy (belated) Australia Day! I hope all you Aussies had a great long weekend and celebrated with some snags on the barbie, a meat pie and a pav! 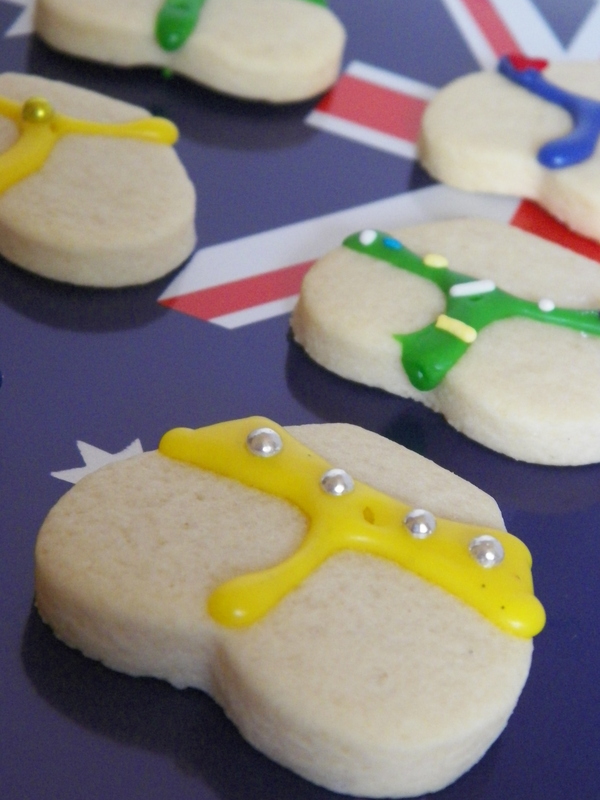 If you are not an Aussie, you should definitely still celebrate with some snags on the barbie, a meat pie and a pav – or make some of these super cute and cheeky beach bum cookies to embrance your inner Australian! I saw these cookies on Pinterest a while ago, and just had to make them – they are too cute! They are really easy to make and decorate too. This recipe is once again from the fantastic Sweetapolita – they are basically the vanilla version of the Dark Chocolate Sugar Cookies with Gingerbread Buttercream that I made for Christmas. I halved the recipe, and I still had close to 50 cookies, so if you do not want that many, you could simply halve it again. You can put any flavour you like in the cookies as well. I was loyal to the recipe and kept the vanilla bean with a touch of lemon, but you could use any type of extract or oil really, such as Strawberry, Orange, or even Musk. Preheat the oven to 160c fan forced, 170c non fan forced. Line 4 oven trays with baking paper, and set aside. Beat the butter and sugar in a large bowl until pale and fluffy. Beat in the egg until well combined. Sift flour and salt in a separate bowl, and gradually stir, with a wooden spoon, into the butter and sugar mixture. Knead the dough on a floured surface until smooth – keep adding flour in very small amounts if dough is still sticky. Divide dough into two batches, wrap tightly in cling wrap, and refrigerate for 45 minutes. Once dough is chilled, roll it out with a rolling pin, between two sheets of baking paper, until the dough is just under 1cm thick. 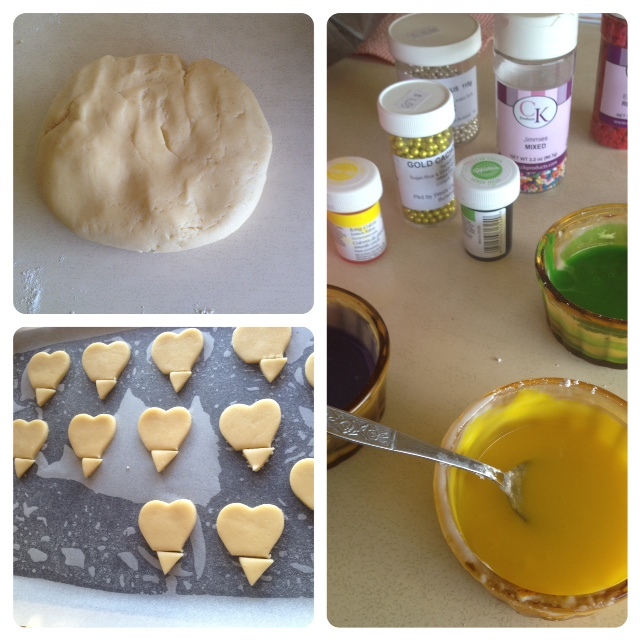 With a heart shaped cookie cutter, carefully cut the shapes from the dough and place on the baking paper. When you have a full tray, gently and quickly cut the bottoms of the hearts off with a sharp, non-cerated knife. You don’t want to use a cerated bread and butter knife because it’s not sharp enough, and will cut a rough edge, rather than a clean edge. The only thing I would do differently when I make these again, would be to get a larger cookie cutter and cut off more from the bottom of the heart, so that they look like bigger, rounder bums!! Bake cookies in preheated oven for 12-15 minutes – make sure you check at 10 minutes! TIP – Don’t wait until the cookies begin to go brown – once the edges a even a tiny bit brown, the biscuits will be that overcooked you could nearly break your teeth on them! Make sure all the cookies are still completely ‘blonde.’ Let the cookies cool completely on the trays or wire racks until completely cool – you don’t want the icing to melt off! To make the icing, combine icing sugar mixture with a tiny amount of water to make a paste. You can make as many or as little colours as you like – three was enough for me. Add a little of the colouring gel and a small amount of vanilla and stir until combined. Place icing in a piping bag fitted with a realllllllly small round nozzle. If you don’t have one, never fear! You can use a snap lock bag and cut the corner off. 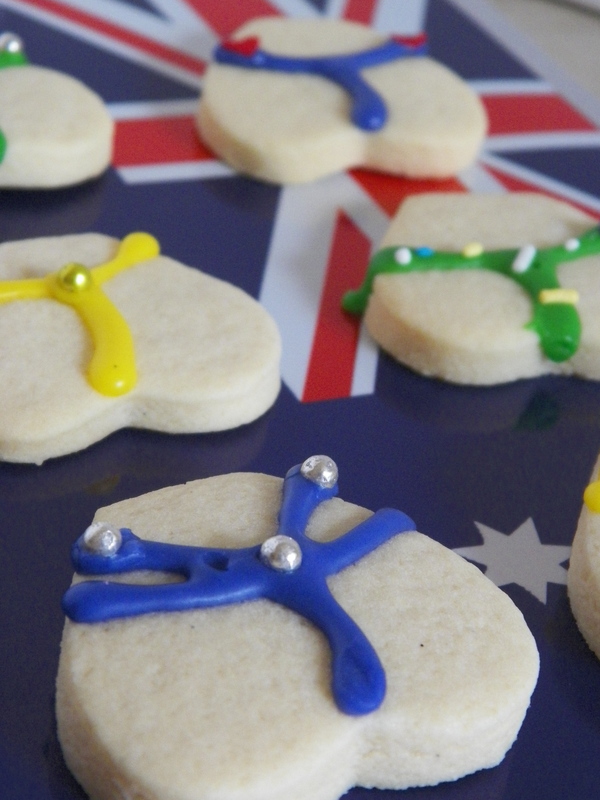 Decorate the cookies by piping different shapes and colours of underwear! G-Strings are the easiest to do 😛 The icing dries really quickly, so decorate the cookies as you go. I can’t believe it is the end of January already, it seemed like only yesterday it was Christmas! Happy belated Australia Day, and I’ll see you in February 🙂 Also, check out my music player on the side of the page, I will putting up some of my favourite songs for you to listen to when you come and visit! Haha! I love the name for these ridiculously CHEEKY cookies!